Sadly there has been an increase in incidents of trains colliding with and killing elephants in Sri Lanka. So far this year 12 elephants have been killed by trains and a total of 83 elephants have died from previous incidents (Department of Wildlife Conservation and the Minister for Wildlife). Early warning systems. Such systems would have to be piloted to confirm their effectiveness and elephants can become immune to repetitive warning sounds after a while and ignore such warnings. While going hi-tech or providing safe passages is theoretically effective and attractive it would be preferable to find a simpler solution that is low maintenance and readily enforced, implemented and sustainable over the long term. In particular, it needs to be easily understood and applied by the train drivers. There is an alternative proposed by the team at our Sri Lanka Elephant and Wildlife Conservation project, which could be the most effective solution due to its simplicity. It could also be easily integrated to the administrative and operations framework, traffic code and regulations of the Sri Lanka Railways. Most importantly it would be easy for train drivers to follow as it’s a system they already use. Trains are controlled by their very own ‘highway code’ to keep them a safe distance apart. Railway lines are divided into sections called blocks where only one train at a time is allowed. Traffic light signals control trains, with signals showing cautionary yellow and stop and go, red and green lights. Trackside signals control the entry and exit from each block, warning trains when the line ahead might be occupied and if they must reduce speed or stop. Just like on the road, along with the traffic lights there are speed limit signs signaling drivers to reduce speeds in built up areas and where there are hazards. Using traffic colour light signals would be the simplest of solutions to stop trains colliding with elephants, in areas where the train tracks passes through known elephant corridors such as along the rail tracks from Maho Junction to Trincomalee, Batticaloa, Anuradhapura, Thalaimannar and Kankasanthurai and on the tracks going to Manner and Jaffna. A set of colour traffic lights at the approach to the blocks that pass through elephant crossing points along railways tracks and speed signs will not only warn but also indicate to the train engine drivers to reduce their speed to 10 km/hour. At this speed the train can be easily brought to a stop when elephants are spotted crossing the tracks. 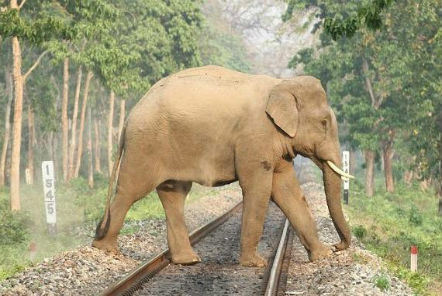 The train will maintain a 10 km/hour speed until it sees the “go” green light indicating that the train has now passed the blocks in the elephant corridor and can proceed as usual. The method outlined is simple to implement, based on the current train operating traffic codes and regulations and only requires minimal training for the train drivers. An important first step is to conduct research to identify the exact location and coordinates of the elephant corridors and elephant crossing points along the tracks to plan where to install the traffic lights. If you would like to find out more or get directly involved in this project and help manage human-elephant interaction please see our Sri Lanka Elephant and Wildlife Conservation page.